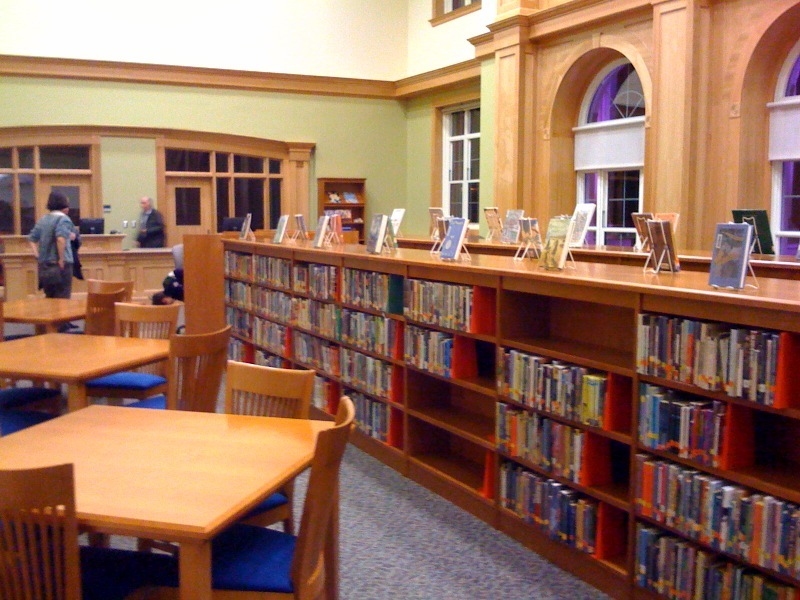 The renovated library at Nathan Bishop Middle School. Formerly classified as a “school in need of improvement,” Nathan Bishop Middle School seemed a hopeless case just a few years ago. Declining enrollments and lagging scores provoked Superintendent Donnie Evans to announce its closure in 2006. But the Providence East Side community drew together in a network of support which eventually led to a 35 million dollar renovation and subsequent reopening of the school this year with a class of approximately 250 sixth graders. This evening, the East Side public school hosted an open house with congratulatory speeches from Mayor David N. Cicilline, Providence Councilman Cliff Wood, a current student and former alum. Then neighbors and visitors took to the halls to explore past rows of shiny maroon lockers into their state-of-the-art science lab; art room; basketball courts; library packed with books and rows of new Dell computers; renovated historic theater; and classrooms equipped with smart boards. Although it’ll be nearly a decade until my daughter enters the sixth grade, it was quite inspiring to see my city taking on the renovation of a school. Hopefully, there are more to come.